This product is suitable for use with Underfloor Heating. Drying Time: Rewmar RP will dry in 45 – 60 minutes per coat (@ 50% RH & 20˚C). 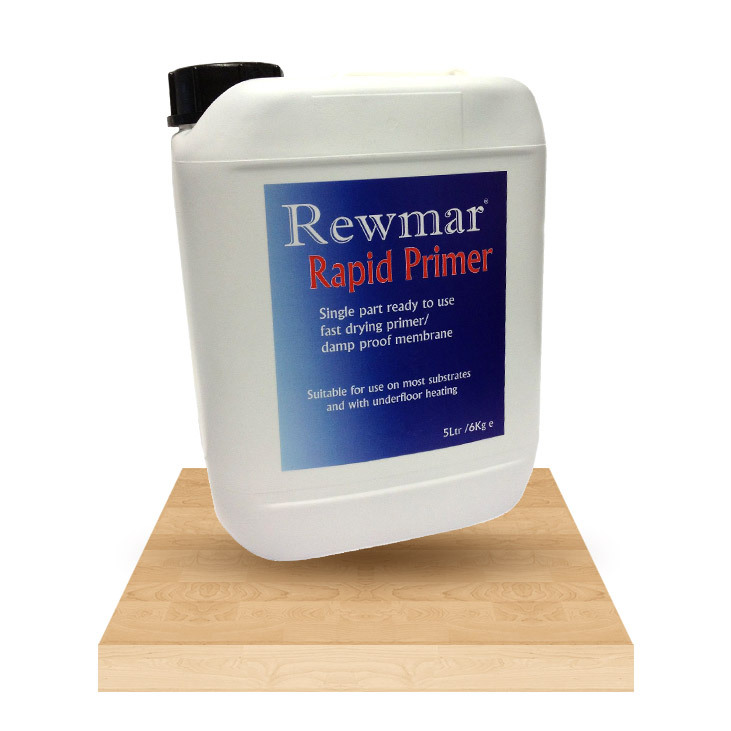 Rewmar Rapid Primer is a fast drying, one part polyurethane based primer. It designed for use over all sand / cement screeds that are not under hydrostatic pressure and contain up to a maximum of 95% relative humidity. For use as an adherence primer apply one coat over porous / non porous & smooth surfaces. For use as a moisture barrier apply two or three coats in cross layers, if the concrete moisture is over 95% then use Rewmar MB – 2 Part Epoxy DPM. Rewmar RP can be applied on concrete screeds containing up to 95% RH with two – three coats. This product is not suitable for use with bitumen substrates, you must use Rewmar MB. 1 Coat: Rewmar RP can be used as fast drying adherence primer on porous / non-porous or smooth substrates (ceramic tiles, adherent and cohesive paints, traces of old glues, etc.). It can be applied either before or after applying a screed/latex but before applying Rewmar MS Polymer adhesive. 2 -3 Coats: Applied in cross layers, Rewmar RP can be used as a moisture barrier for waterproofing of absorbent surfaces up to 95%RH. Note: if the Concrete Moisture is over 75%RH and a liquid batten installation is performed then Rewmar MB must be used. The substrates must be sound, free of splits, dust, grease or other contaminants that could affect adhesion. For substrates that are non-porous or smooth it is necessary to abrade the surface prior to application of Rewmar RP. Harmful. Always read the MSDS sheet before use.